In a medium saucepan, bring the water and 1 teaspoon salt to a boil. Add the cornmeal in a slow stream, whisking constantly. Whisk in 3 tablespoons of the oil. 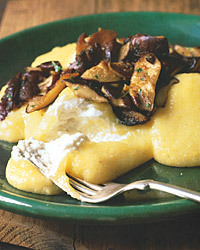 Reduce the heat and simmer, stirring frequently with a wooden spoon, until the polenta is thick, about 20 minutes. Stir in the Parmesan. Remove from the heat but cover to keep warm. In a large frying pan, heat the remaining 2 tablespoons oil with the butter over moderately high heat. Add the mushrooms, garlic, and 1/4 teaspoon salt. Cook, stirring, until the mushrooms are golden, 5 to 10 minutes. Stir in the parsley and pepper. The tannins in a red wine will be tamed by the richness of the cheese in this dish, pushing the wine's flavor to the fore. A Rosso di Montalcino, Brunello's fruitier cousin, will demonstrate this delectably.